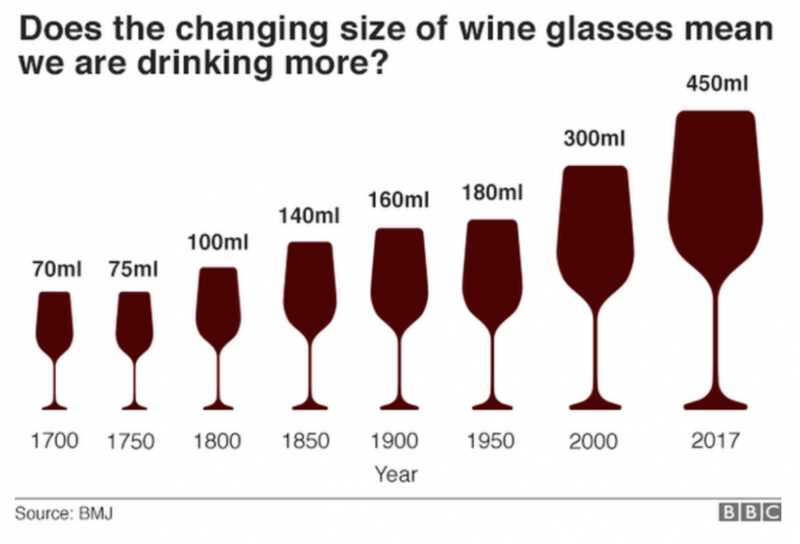 Summary: The size of a wine glass has increased sevenfold in the past 300 years. The increase in wine consumption is speculated to follow this design shift toward larger wine glass size. This underscores an important and often overlooked factor in UX design: context of use. Wine consumption has rocketed, and historically keeps increasing with the size of the glass. Researchers suspect wine glass design is increasing consumption. University of Cambridge researchers found glass size grew from an average 66ml in the 1700s to 449ml today - a near sevenfold increase - and wine drinking nearly doubled from 1980-2004. "When it comes to how much we drink, wine glass size probably does matter," says study author Prof Theresa Marteau. The increase in the capacity of wine glasses has been more rapid since the 1990s. The researchers think one reason for this could be that the demand for larger glasses by the US market was met by an increase in the size of glasses made in England. What can we learn from this design shift? 1. "Form follows function" (a design concept that says an interface must be dictated by it's intended use)-- but we can also see here how consumption follows form! Yep! Consumption (or user behavior) follows form (an interface), and form influences behavior. Behavior can be influenced by an interface, which explains why Facebook is an addictive "can't pull away" experience for many. The more you scroll, the more content you discover. 2. The cultural pattern in the United States is to super-size a portion of food or drink. In many countries this is considered bad taste or repulsive. An example in localization design is Kettle Chips--when they launched in the UK, they labeled their medium sized bags "Perfect for Sharing", to soften the notion they were grossly sized, a cultural no-no in the UK. What else shapes design, as well as user behavior? Understanding context of use means that a designer knows where, when and under what conditions your product will be used. Influences such as the physical, social, emotional and cognitive factors all dictate how an interface ought to be designed. They also dictate how comfortable users will feel using the design under their conditions (context) of use. Example: An interface for a fast-food pizza restaurant. The interface has a reporting function. How should it be designed? Emotional: Want to know how we did tonight (earnings); Want to get home and have a timely close of business. Design recommendation (supporting context of use): A screen that can be viewed best in the dark, at a distance, with repeat tallies. Large, clear and clean fonts. Clear expectations of how long reporting takes and when the results will be ready. 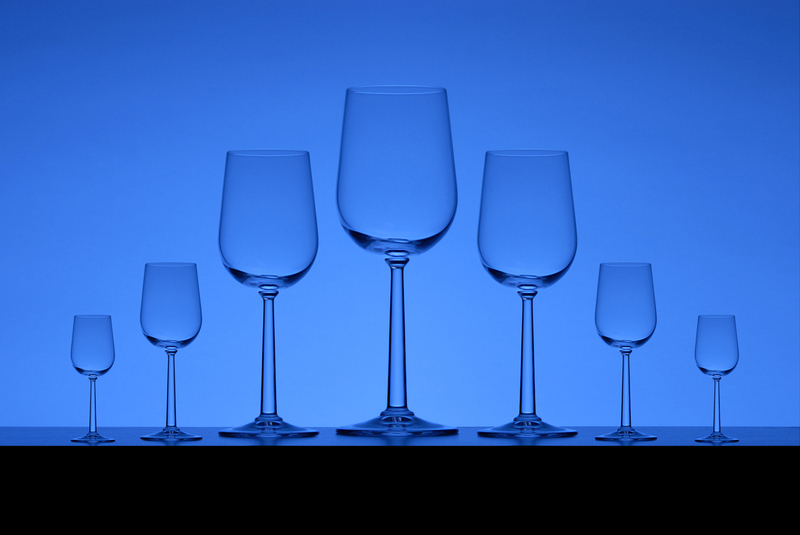 Back to wine glass design...The study found that people drinking from large wine glasses felt they didn't get enough. Large glasses encouraged the perception of consumption. Key take-away: by understanding the context of consumption (what factors are influencing how a task is performed) you make or break ease of use and user adoption. In today's wine bar, if you provide a tiny glass, your customers will feel different than if you provide them a large glass. The beverage industry (and restaurants) know: provide them a large glass of wine and they will drink more. Likewise, savvy UX Designers know: provide designs that match user context and your users will love you and feel like you know them well.